such as lighting and heating. of the supply vary in unison. phase electricity in a domestic or small commercial environment. The most important class of a three-phase load is the electric motor. Such motors are applied in industry for pumps, fans, blowers, compressors, conveyor drives etc. Large air conditioning equipment (units above 8.8 kW cooling capacity) use three-phase motors for reasons of efficiency and economy. Resistance type heating such as electric boilers may be connected to three-phase systems. Electric lighting may also be similarly connected. These types of loads do not require the revolving magnetic field characteristic of three-phase motors but take advantage of the higher voltage and power level usually associated with three-phase distribution. Large rectifier systems may have three-phase inputs. The resulting DC current is easier to filter (smooth) than the output of a single-phase rectifier. Such rectifiers may be used for battery charging, electrolysis processes such as aluminum production or for operation of DC motors. At the power station, an electrical generator converts mechanical power into a set of alternating electric currents, one from each electromagnetic coil or winding of the generator. The currents are sinusoidal functions of time, all at the same frequency but with different phases. In a three-phase system the phases are spaced equally, giving a phase separation of 120°. The frequency is typically 50 Hz in Europe and 60 Hz in the US (see List of countries http://en.wikipedia.org/wiki/Mains_power_around_the_world). The currents in each conductor reach their peak instantaneous values sequentially, not simultaneously; in each cycle of the power frequency, first one, then the second, then the third current reaches its maximum value. The waveforms of the three supply conductors are offset from one another in time (delayed in phase) by one-third of their period. 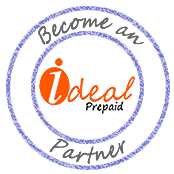 Three phase has properties that make it very desirable in electric power systems. Such as: The phase currents tend to cancel one another (summing to zero in the case of a linear balanced load). This makes it possible to eliminate the neutral conductor on some lines; Power transfer into a linear balanced load is constant, which helps to reduce generator and motor vibrations; Three-phase systems can produce a magnetic field that rotates in a specified direction, which simplifies the design of electric motors. A single-phase load may be powered from a three-phase distribution system either by a connection between a phase and neutral or by connecting the load between two phases. The load device must be designed for the voltage in each case. In places using a 415 volt 3 phase system, the phase-to-neutral voltage is 240 volts, allowing single-phase lighting to be connected phase-to-neutral while three-phase motors to be connected to all three phases. In North America, a typical three-phase system will have 208 volts between the phases and 120 volts between the phase and neutral. If heating equipment designed for the 240-volt three-wire single phase system is connected to two phases of a 208 volt supply, it will only produce 75% of its rated heating effect. Single-phase motors may have taps to allow their use on either 208 V or 240 V supplies. 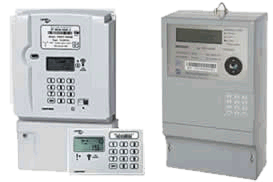 Gas Meters are categorized depending on the volume (flux) of the meter. 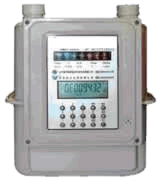 Gas Meters are generally measure in cubic meters per hour. Gases are compressible and change volume when placed under pressure or are heated or cooled. A volume of gas under one set of pressure and temperature conditions is not equivalent to the same gas under different conditions. When gases or liquids are transferred for their energy content, such as the sale of natural gas, the flow rate may also be expressed in terms of energy flow, such as GJ/hour or BTU/day. The energy flow rate is the volume flow rate multiplied by the energy content per unit volume or mass flow rate multiplied by the energy content per unit mass. Most flow meters will be used to calculate the volume or mass flow rate which is then adjusted to the energy flow rate by the use of algorithms to turn the raw flow data into volumes at base conditions (consisting of specified absolute pressure and temperature). Typical water meters are mechanical flow meters. Commonly used meters are piston meters, also known as rotary piston or semi-positive displacement meters. The piston meter operates on the principle of a piston rotating within a chamber of known volume. For each rotation, a count for the amount of liquid is computed. 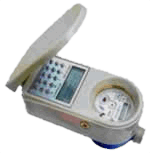 Various prepaid water meter are available depending on the nominal bore (NB). NB (nominal bore) also refers to Nominal Pipe Size (NPS). The Nominal Pipe Size (NPS) is a North American set of standard sizes for pipes used for high or low pressures and temperatures also indicating the required wall thickness. The European designation equivalent to NPS is DN (nominal diameter) in which pipe sizes are measured in millimeters. Based on the pipe size, the outside diameter (OD) and wall thickness can is obtained by use of reference tables. See: http://www.engineeringtoolbox.com/commercial-pipe-metric-data-d_1496.html.